Our Solar Designers each have college degrees and special training in the design of solar systems. They’ll use an aerial image of your place in addition to the information you provide to design the just the right solar system for you. Kate has a passion for the outdoors and is committed to preserving this planet for both people and animals. She spent several years rehabilitating wildlife and striving towards a greener lifestyle before relocating to Vermont. She is an avid hiker and loves being a part of the local food community. 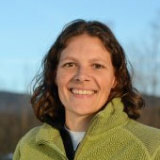 Kate joined SunCommon to help Vermonters go solar!